I love the authors who ditch the ordinary for the extraordinary, who take risks in their writing, who deliver the different to readers. Every time I open a book by Jay Crownover, I know it’s going to be a voyage into unchartered territory. 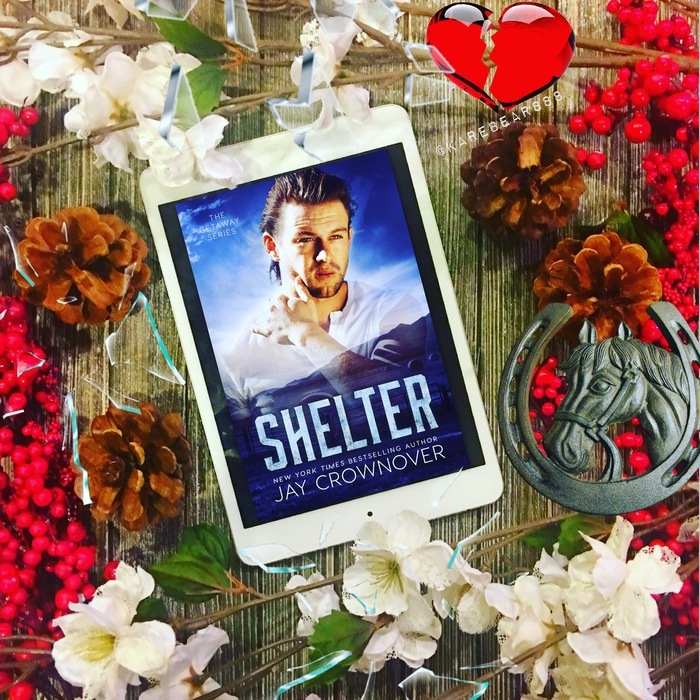 Just like all of Jay Crownover’s other out-of-the box books, Shelter is UNIQUE, UNPREDICTABLE, and UTTERLY BRILLIANT. The Getaway series continues to be one INCREDIBLY INTENSE ADVENTURE!!! Shelter is tale of tough love but also a story of survival, second chances, and strength. Shelter is a roller coaster ride of an adventure with twists and turns, and ups and downs—one that takes the senses for a spin. Shelter is a fierce and fiery flame of a love story that burns all over. Shelter is a fusion of feels where no emotion is left untouched. Shelter is UNPUTDOWNABLE. Shelter is EVERYTHING!!!! Jay Crownover has truly outdone herself with this masterful, intensely mesmerizing portrait of a broken hero and heroine who fight the hardest of battles to become whole. Emerys and Suttons’ life-altering journey continues in Shelter. A hero and heroine, both strong and stubborn, may learn that the best way to heal and put their broken pieces together may be to come together as one. Like older brother, Warner, Sutton is a man’s man. Tall. Rugged. Handsome. Brooding. Stubborn. Tough. Tender. Sutton is my favorite Warner brother and near the top of all of Jay Crownover’s complex and tough but tender heroes. Emerys is a tall beauty who sees the light in others’ dark. She is the perfect complement to Sutton: the soft to his hard. Emerys is as bold as she is beautiful, and one of the strongest heroines I’ve encountered. Sutton and Emerys are on fire together!!! Their chemistry is COMBUSTIBLE! This hero and heroine are imperfectly perfect but so perfect for each other in every way. It’s as if Sutton and Enerys were forged together by fate, calming each others’ storms. I LOVED THIS HEART-POUNDING ROMANCE!!! My heart pounded out of my chest where I forgot to breathe. Tears streamed down my face as Shelter—this mix of SORROW, SWEETNESS and SOUL—struck me hard, igniting every emotion. Shelter struck me everywhere!!! I was so lost in this story that I didn’t want to be found. Humming with rich descriptions, deep emotions, and razor-sharp intensity, Shelter tears at the heartstrings in a journey felt all over. What a RUSH!!! Twists and turns. Fire and ice. Dark and light. Love and loss. Chase and calm. This book BUZZES WITH EXCITEMENT!!! Shelter is a heart-clenching thriller of a tale of love wrapped in heroism, heartbreak, hope, and healing that strikes straight to the core. Shelter is the BEST EMOTIONAL CHAOS!!! Like a shard of glass, Shelter shines and then cuts deep. An ADRENALINE RUSH spiked with HEAT and HEART, Shelter is an ADVENTURE lived and a story loved long after the last page.